Sales of the recently redesigned RAV4 surged 28 percent to 19,538, for the sixth straight best-ever month. LOS ANGELES -- Toyota Motor Sales U.S.A. reported July sales increased 17 percent to 193,394 units, led by strong performances by Camry, Prius, RAV4 and Avalon nameplates. It was the first time since March 2010 that Toyota had outsold Ford Motor Co.
Toyota Division sales, including Scion, rose 16 percent to 170,363, while sales at the Lexus brand jumped 26 percent to 23,031. Scion-only sales, though, fell 9 percent to 6,261. Camry, with 34,780 sales, had its best July since 2010. However, Edmunds.com data showed that Camry incentives were at their highest level in nearly two years and were four times more than those on the Honda Accord. Bill Fay, Toyota Division general manager, countered, "I think we're fine. Industry incentives were up month over month, but our incentive spending is still below the industry average. We're in a good place. We've got a lot of momentum." Sales of the Prius family of vehicles increased 40 percent to 23,294, for the best month ever for the nameplate. The recently redesigned RAV4 had sales surge 28 percent to 19,538, for the sixth straight best-ever month. And sales of Toyota pickups increased 16 percent despite the sell-down of the Tundra full-sized pickup. Although sales of the outgoing Corolla rose just 4 percent, Fay called July "one of the smoother sell-downs for one of our core models." The redesigned 2014 model just began production. 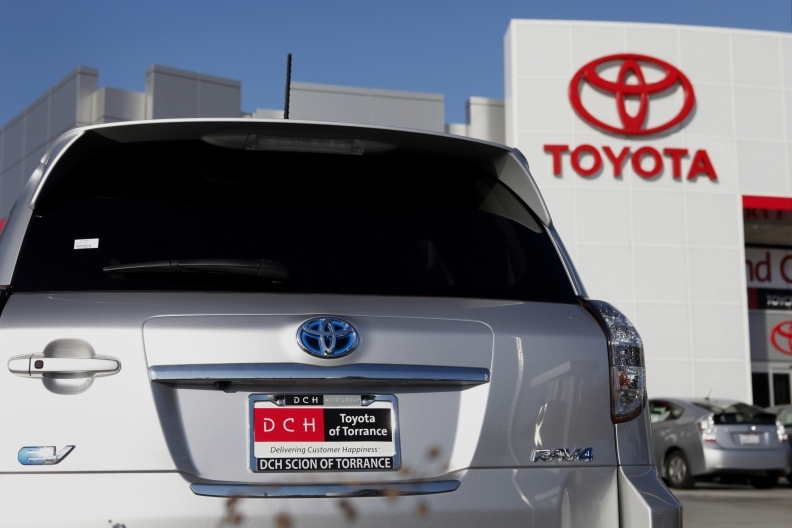 Fleet sales were just 4.5 percent of the mix for Toyota Division, the company said. Toyota will keep the incentives flowing with its annual "Clearance Event" in August, with "a series of APR and affordable leases," Fay said. Although marketing will be conducted nationally, the incentives will be established by each of Toyota's regions, with special attention paid to the Corolla and Tundra, he said. On the Lexus side, the volume leaders were the RX crossover, up 15 percent to 8,437, and the ES sedan, up 62 percent to 6,089. The recently redesigned IS sedan also gained 59 percent to 3,641. Lexus' strong run has prompted Jeff Bracken, the brand's general manager, to boost the brand's 2013 U.S. sales goal to 270,000 from 260,000 previously. "As the best months of the year are still ahead of us," he said, "we are going to challenge ourselves even further."